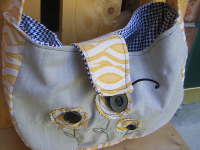 The bag has been delivered - so I can show you how it turned out! it started with a completely different motif that was just... trying too hard, so it got unpicked. Then the dimensions were just not quite right - so unpicked, cut, resewn... I'm glad to be done with this one - but I do like how it turned out! 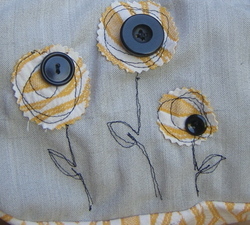 It's from mostly vintage fabric and vintage buttons. 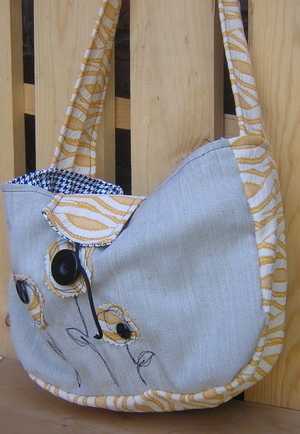 It has one pocket inside, relatively short strap, and freehand quilting on the front. It's the smallest bag I've made so far. I couldn't decide how to fasten it, but eventually tried this - it works okay - the string wraps around the biggest button. I don't know if she'll like it or not - she's a super-cute newly 21-year-old, but it was fun to design, so whatever!